The hacker guessed that Alaska's governor had met her husband in high school, and knew Palin's date of birth and home Zip code. Using those details, the hacker tricked Yahoo Inc.'s service into assigning a new password, "popcorn," for Palin's e-mail account, according to a chronology of the crime published on the Web site where the hacking was first revealed. UPDATE: The AP is refusing to cooperate with a Secret Service request for copies of the leaked e-mails. The group known as Anonymous, which earlier took on Scientology, has published screenshots of e-mail messages and images that it says came from a private e-mail account belonging to Governor Sarah Palin at gov.palin@yahoo.com. The data has been published by WikiLeaks. Threat Level has confirmed the authenticity of at least one of the e-mails. 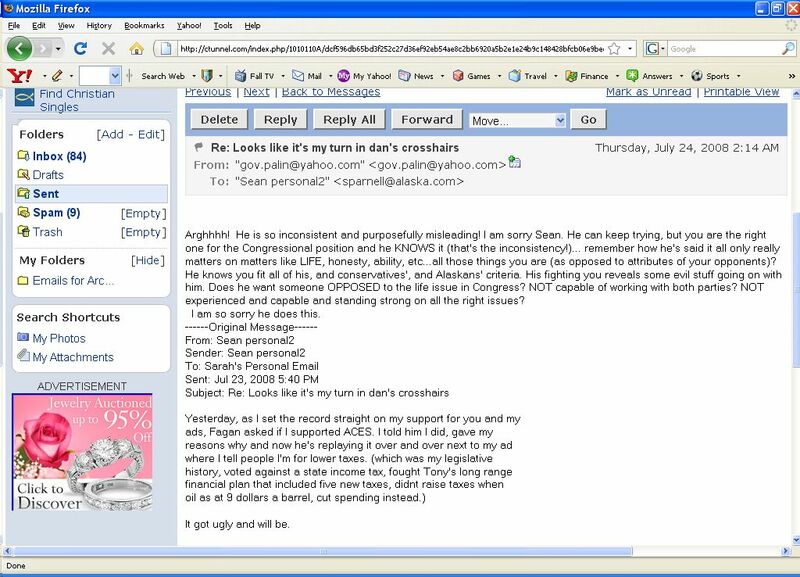 The information includes five screenshots from Palin's account, including the text of an e-mail exchange with Alaskan Lieutenant Governor Sean Parnell about his campaign for Congress. The internet activist group 'anonymous', famed for its exposure of unethical behavior by the Scientology cult, has now gone after the Alaskan governor and republican Vice-Presidential candidate Sarah Palin. At around midnight last night the group gained access to governor Palin's email account ... and handed over the contents to the government sunshine site Wikileaks.org. Governor Palin has come under media criticism in the past week for using pseudo-private email accounts to avoid Alaskan freedom of information laws. 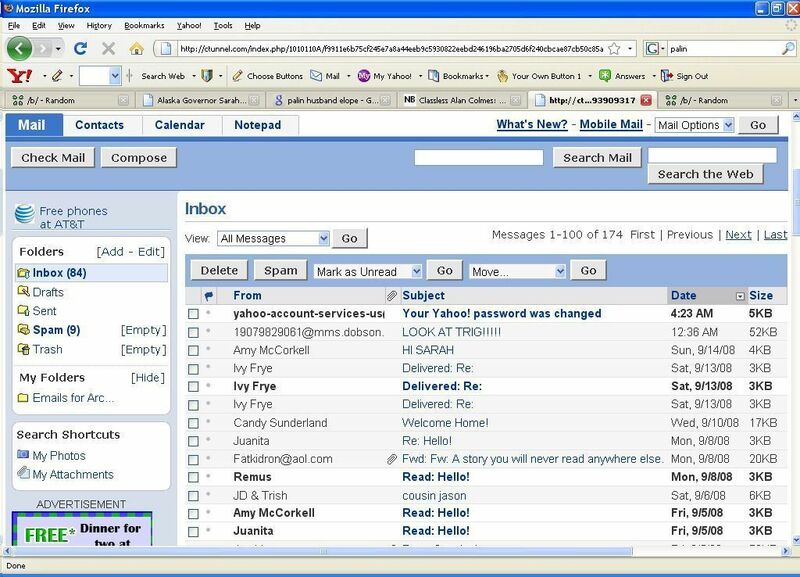 The zip archive made available by Wikileaks contains screen shots of Palin's inbox, two example emails, governor Palin's address box and a couple of family photos. While the emails released so far reveal little, the list of correspondence appears to re-enforce the criticism that Palin is mixing governmental and personal affairs. So, you know those Yahoo accounts Sarah Palin was using to keep her official business safe from subpoenas? Turns out they're not so safe after all. Palin's Yahoo accounts (gov.palin@yahoo.com and gov.sarah@yahoo.com) were successfully hacked last night ... Since then, the accounts have been deleted, which could be considered destruction of evidence if a court chose to pursue it. The rest of the screenshots are here.